These two little fellows popped up in my sketchbook yesterday. Which had me thinking about when my girls were little and our bedtime rituals. Which of course, included a nightly bedtime story. 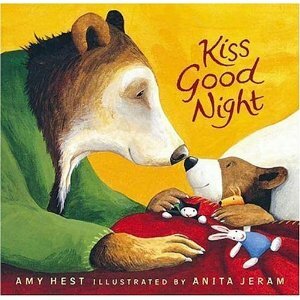 One that sticks out in my mind that captured my heart when my girls were little was Kiss Good Night by Amy Hest and illustrated by Anita Jeram. Anita illustrated Guess How Much I Love You, this book is night and day from her light and playful watercolors. It's filled with rich, painterly color and a sweet night time, fall-inspired mood that makes you feel all snuggly. If you haven't had a chance to read this one, take a peek at it. My youngest was 5 when this book first came out and we enjoyed cuddling up for a good snuggle while we read this story together. Sometimes my older daughter would read it to us. Those days passed so quickly. I wish I could have slowed them down and spent more time in those moments. It's funny how a picture book is now a little snapshot of that time, with it's words and illsutrations it can conjure up those memories and feelings. What an amazing honor to be a part of a family's history in the form of a beloved bedtime story. I hope one day new moms are reading my stories and sharing my artwork as they tuck in their precious little ones at night. I like the books. Nice Info . Do you mind if I talk about this post in my blog. You and your blog will surely get the credit.